Foster parents provide temporary homes to our kitties while they await their forever homes. 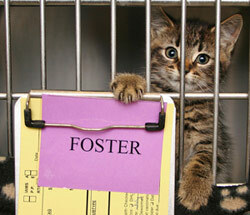 In many cases, a foster is directly responsible for giving an animal a second chance at life. Fostering is a very rewarding experience; foster parents often report experiencing intense love from their foster animal in return for their efforts. Most cats thrive when placed into a foster home. In our experience, cats in foster homes adjust well to family environments and recover much more quickly from illness, injury, and trauma. We typically have a variety of cats of all ages in need of foster homes. Young kittens may require special attention such as bottle feeding and warming. We seek fosters in the greater Los Angeles, California and Dallas-Fort Worth, Texas areas. We do not have foster opportunities available in other parts of the country at this time. If you are interesting in fostering with us, please read and submit our Foster Application & Agreement.